Northumberland County Council officials at the opening of the new look Newbiggin Library. 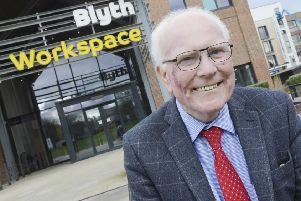 A library has marked a new chapter in its history after opening in its new base. Newbiggin Library opened the doors last Saturday to its new home in the town’s sports and community centre after moving out of its former premises in Cleveland School Building, Gibson Street, last October. After taking up temporary residence on the ground floor in the sports centre, work has been completed on a new modern space at the facility. The library now features better facilities for book borrowers and other users, a new entrance to the sports centre, and a small café area installed. The move to relocate Newbiggin Library is part of a programme of works to co-locate library with other leisure services to create new community hubs across the county. Northumberland County Council has invested more than £40million into improving leisure centres and facilities, including £80,000 at Newbiggin. Council leader Coun Grant Davey said: “The relocation of the library into the sports and community centre makes perfect sense for residents and delivery of services in Newbiggin. “We’re delighted to see Newbiggin Library move into its new home and we’re looking forward to seeing it well-used by community groups, book borrowers and other users. Newbiggin councillor Liz Simpson said: “We’re delighted to see Newbiggin Library open in its new, permanent home and we hope library users will enjoy the first-rate facilities. Newbiggin Library is open from 8am to 10pm weekdays, 9am to 8pm on Saturdays, and 9am to 10pm on Sundays. Ashington Library opened in January 2016 as part of the £20million new purpose-built complex at Ashington Leisure Centre, and boasts a huge range of books, an IT hub with 18 computer terminals and a bespoke children’s library. Cramlington Library moved from its premises on Forum Way into a newly created space at the front of the Concordia Leisure Centre building in July 2016 as part of a £3.5million transformation programme.